Dr. Khabensky, leading implant dentist in Brooklyn provide the best options for teeth replacement. We use only the most advanced and newest dental equipment in the USA. Offering teeth implants to suit every need, from single tooth implant to fill a single space to low cost dental implants that take the place of dentures. Come to our dental implant clinic to receive the most efficient, functional, and highly esthetic results. We use only the best quality medical grade titanium or titanium alloy for our implants. Our immediate implant placement may be placed the same day as the implant is inserted. Meet our cosmetic dentists in Brooklyn Alex and Igor Khabensky DDS to get the fastest & painless dental implant treatments. The implant screw: Gets permanently attached to your jaw, serving as the root for new teeth. The abutment: A connector that gets attached to the implant, holds the new tooth or a set of teeth. The crown: A prosthetic tooth that will be visible. Dental implants are replacement teeth made from medical-grade titanium alloy which is a metal that is highly biocompatible with your body. Our leading dental implant specialist will surgically insert and fuse the implant post into the jawbone, artificially replacing a real tooth root. Once the post integrates and bonds with the bone around it (osseointegration), the abutment gets installed, which will hold the crown. Then, our skilled periodontist will cap the post and abutment with a tooth-colored, natural-looking dental crown, dentures or bridges. Brooklyn dental implants will help you smile more, speak more clearly, and chew better. Dental implants have become the go-to teeth replacement option for patients in Brooklyn to achieve a winning smile makeover. 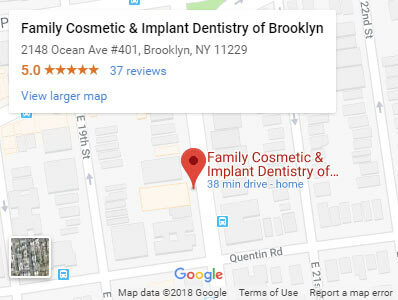 Implant dentists at Family Cosmetic & Implant Dentistry of Brooklyn, named one of 2018 America’s best dentists, take your comfort and convenience seriously. Your family dentist in Brooklyn first decides whether cheap dental implants are appropriate for you after a thorough exam. It helps that your implant dentist, also trained and certified in cosmetic dentistry, knows you and your oral history when it comes to recommending low cost dental implants. Sometimes, you may need to have a tooth pulled or a root canal before teeth implants are inserted. To anchor the implants, posts made of titanium are implanted directly into your jawbone. When the first post is secure, another post is attached. This is called an abutment. It’s the piece that anchors the crown, serving as your new tooth. Is the dental implants procedure painful? Our Brooklyn dental implant specialist do everything they can to make the procedure as comfortable as possible. We offer a variety of pain management options during the dental implant procedure, making it practically painless. How long is the implant recovery period? Dental implant recovery will slightly differ for every patient. Most patients don’t even need pain medication after the dental implants procedure. In order for your implant to heal quicker and to avoid any dental implant problems, you should stick to a soft food diet for a few weeks. After that, you can treat your teeth implants as your natural teeth. 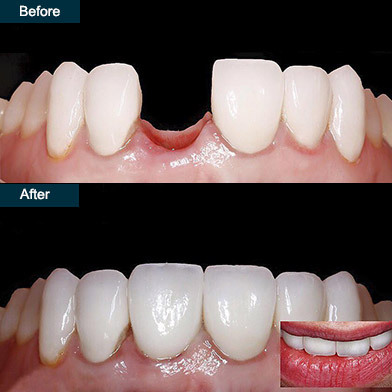 Dental implant is an excellent treatment that has a very high success rate, typically 95% or more. This is made possible because during osseointegration, the lightweight titanium posts used in dental implants treatment easily fuse with the jawbone as if they are the natural tooth roots. The technology used to place a dental implant is tried and tested and should last you for years if not for life. Instead of wondering if your natural tooth will survive another round of root canal therapy, with an implant tooth, you should be able to enjoy many years of trouble-free use. Candidates for dental implants procedure in Brooklyn need to have good oral and general health. You should have no periodontal disease, healthy gum tissue, and sufficient bone in order to secure the dental implant post. 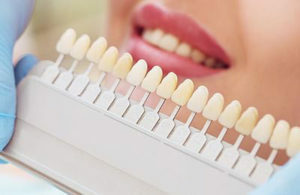 if you aren’t a candidate for implants, press on porcelain veneers may be the right choice custom-made veneers or prepless veneers. Your affordable dental implant cost depends on how many teeth are being inserted, what condition your mouth is in and what other dental services you need. Unfortunately, most dental insurers regard implants as being a cosmetic treatment even given the potential benefits of this treatment. While the cost of dental implants is usually not covered, it may be possible to claim the costs of an implant crown under your insurance policy. It is always worth checking with your insurance provider to see if you can claim back any of the costs associated with dental implants treatment. A tooth implant is designed to fuse with your jaw. Eventually, it becomes indistinguishable from your natural teeth. You won’t have to experience the sometimes-difficult issues you may encounter with ill-fitting dentures. Even cheap dental implants from your Brooklyn cosmetic dentist are secure and stable. Chewing is easier since affordable dental implants function just as effectively as your own teeth, allowing you to enjoy all your favorite foods. You won’t face the discomfort of bridges or even partial dentures as dental implants literally are a part of your mouth. You enjoy better overall dental health because your low cost dental implants help you keep more of your natural teeth. Affordable dental implants are convenient and don’t require that you use adhesives or special cleaners to maintain. With a smile makeover that includes teeth implants, your self-esteem can soar and your confidence levels improve drastically. Do you have any questions about dental implants in Brooklyn? Would you like to schedule an appointment with a Board Certified Periodontist and best rated implant dentist, Khabensky DDS of Family Cosmetic & Implants Dentistry of Brooklyn? Please contact our dental clinic for a consultation with our top implant dentists Alex and Igor Khabensky DDS.